Game of Thrones Film Destinations of Dubrovnik - Do I need Guided Tour? Home > Blog > Croatia > Do you need a tour to see the Game of Thrones Film Destinations of Dubrovnik? Dubrovnik’s tourism industry has boomed since it was used as film location of King’s Landing in Game of Thrones. The Old Town of Dubrovnik was founded in 7th Century and is a UNESCO World Heritage site, and is surrounded by hand built medieval fortifications. 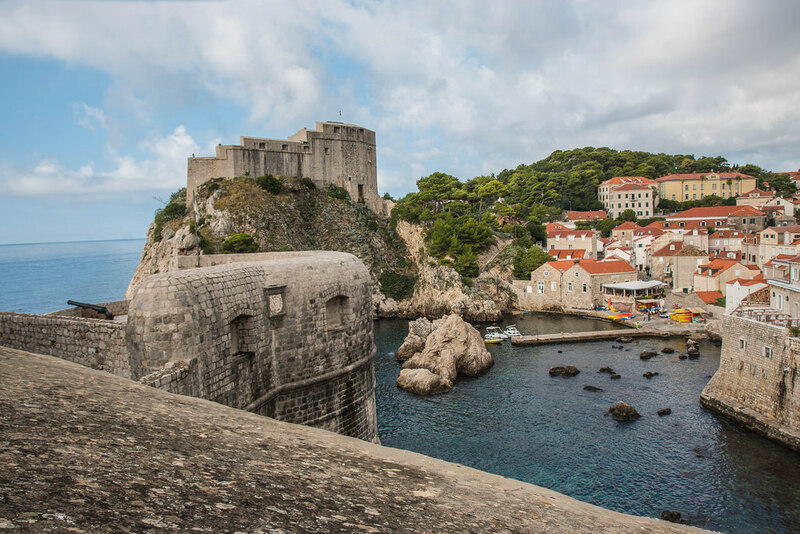 Do you need a tour to see the Game of Thrones Film Destinations of Dubrovnik? Or is it possible to do it yourself? According to many travel bloggers, including Ryazan Tristram, it is possible to devise a DIY Travel Itinerary to Dubrovnik, Croatia. The sites where the filming took place are completely accessible, and most of the Old Town is very walkable (although be aware of many steps!). Spend at least 4 hours exploring the Old Town of Dubrovnik on foot as a minimum. I would recommend at least a few days in the city to fully appreciate what Dubrovnik has to offer. You will enter the Old Town via Pila or Ploce gate, to blur the boundaries between fantasy and reality. Tyrion talks with Lancel Lannister at Ploce gate in “The Ghost of Harrenhal”. It also features as an end to Cersei’s walk of atonement. St Dominika Street is a famous cobbled street in the central Old Town of Dubrovnik and was featured in several market scenes bustling with animals, peasants and traders in the Game of Thrones. It’s almost famous for the gold cloaks scene, and you will recognise the route as the one taken by Cersei Lannister, when she walked naked as penance for her sins towards Ploce Gate. Fort Lovrijenac at the Western side of the old town, is positioned on a 37 metre high cliff. It’s a triangular shaped fort with 10 canons, and was the residence of the King of the Andals and the First Men, his family and his court. It dominates the skyline of Dubrovnik. One of the most famous scenes filmed here was the massacre in the Red Keep – the result of Eddard Stark’s failed attempt to place King Joffrey Baratheon and his family under arrest in anticipiation of the coronation of the true heir Stannis. Walk down to Dubrovnik Harbour and jump on the boat to Lokrum Island, fictionally known as Qarth. The boat trip takes just 15 minutes and they run until around 6pm. On Lokrum Island you can see where Daenarys the Dragon Queen gets a harsh welcome from the Spice King. As you can see, it is totally possible to see the Game of Thrones Film Destinations of Dubrovnik as a DIY tour. It can be done in one long day or two separate days with the Old Town on one and Lokrum on another. However, the benefits of taking a tour to see the Game of Thrones Film Destinations of Dubrovnik are mainly the expert knowledge of the guide. With the Game of Thrones tour of Dubrovnik on Viator, you will get a tour guide on a three hour walking tour who will give you insights into the Targaryens, Baratheons, Starks and other noble families. There is also the option of adding on a trip to Trsteno Arboretum, the site used as the King’s Landing palace gardens, extending the tour from 3 hours to 5.5. This additional part of the trip is taken by mini bus from and back to the Old Town. Again, you can do this individually, but I preferred to pay extra for the stories and expertise combined with the ease of finding things. Looking for something a little different? How about an Exclusive Game of Thrones Kayaking Tour of Dubrovnik?! adminLeave a Comment on Do you need a tour to see the Game of Thrones Film Destinations of Dubrovnik?